BERN – Russia‘s participation in the Rio Olympics remained in jeopardy on Tuesday after the International Olympic Committee said it would ‘explore legal options’ for banning the country from the Games. At an emergency IOC Executive Board meeting in Switzerland, a day after an independent report detailed a systematic, state-run doping programme in Russia, members fell short of an immediate ban but announced a series of other measures. A five-man disciplinary commission was set up to start proceedings against Russian officials mentioned in the report, which described extensive doping and cover-ups at the Sochi Winter Olympics hosted by Russia in 2014. The IOC also said it would not organise or give patronage to any sports event in Russia, including the planned 2019 European Games, and that no member of the Russian Sports Ministry implicated in the report would be accredited for Rio. With regard to the participation of Russian athletes in Brazil, the IOC said it would “carefully evaluate” the report by Canadian lawyer Richard McLaren, commissioned by the World Anti-Doping Agency. A ban would be humiliating for Russia, which since Soviet times has prided itself on its sporting prowess. President Vladimir Putin has said the affair could split the Olympic movement. The last such schism was in the 1980s, when the United States and Soviet Union each boycotted Olympics hosted by the rival superpower. The IOC said it would have to take into consideration a ruling by the Court of Arbitration for Sport (CAS) on Thursday, as well as the World Anti-Doping Code and the Olympic Charter. CAS is due to rule on the dispute between Russia, 68 of its athletes and the governing body of world athletics, after the country was banned from sending a track and field team to Rio. The McLaren report said positive doping tests at Sochi were covered up and “dirty” urine samples swapped with “clean” ones with methods developed by the domestic intelligence service, while deputy sports minister Yuri Nagornykh decided which athletes would be protected. The IOC has ordered the immediate re-testing of all Russian athletes who took part, as well as a full enquiry. 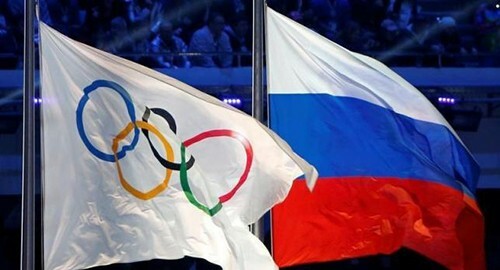 It also instructed all international Olympic Winter Sports Federations to halt preparations for major events in Russia. Sports Minister Vitaly Mutko told the R-Sport news agency he had suspended his anti-doping adviser Natalia Zhelanova as well as Irina Rodionova, deputy head of Russia’s state-funded Sports Preparation Centre, and two other officials. Mutko, mentioned 21 times in the report, said his own suspension was not being discussed and that no allegations had been made against him. Kremlin spokesman Dmitry Peskov said Mutko had not been named in the WADA report as being directly involved in the cover-ups.